One of the most contested territorial disputes in Asia, both the Philippines and China are laying claim to the Scarborough Shoal (known as Huangyan Island in China) – a little more than 100 miles (160km) from the Philippines and 500 miles from China. In some parts of the world corrupt, evil and aggressive politicians can simply raise any claims for territory which historically was unknown to them. Isn’t this why most of the wars were fought? People simply walked into your territory, forcing the natives inland or killing them. Then after some years, they claimed the territory belonged to them and they wanted independence. If the law of 350 nautical miles from your shore is applied, then Batam and Johor must belong to Singapore, according to UNCLOS. For those of you who do not know what UNCLOS means, it is the The United Nations Convention on the Law of the Sea (UNCLOS), also called the Law of the Sea Convention or the Law of the Sea treaty and to give you an understanding of how the Law of the sea is seen, here is an infographic explaining UNCLOS and give you an understanding of the complexity of the issues. So don’t you think the British should return Falkland Islands to Argentina? The potential flash points for this territorial dispute in Asia are the four island groups owned by China but they were and are still being contested by Vietnam, Philippines, Malaysia and Brunei. These four countries are doing it basing their claims on the EEZ (Exclusive Economic Zone) which allows a country to claim the 200 nautical miles from its shore. And beyond the EEZ, a country can claim a continental shelf up to 350 nautical miles from its shore. These clauses are valid and legal only if the island or land within the 350 nautical miles do not belong to another country. The four island groups are: Dongsha (Pratas); Xisha (Paracel); Zhongsha (Macclesfield Bank) and Nansha (Spratly).The ancient maps also stated the coordinates of Xisha and Zhongsha. Can another country produce this sort of concrete evidence? The Chinese has documented evidence of its claims on these island groups since the Han Dynasty (206BC- AD220). The two-volume history record Zhu Fan Zhi (Record of Foreign Peoples), compiled from 1225-1242 by Zhao Rushi also mentioned those islands as Chinese territories. Obviously these Nan Hai Islands (South Sea Islands) are Chinese territories. British admiralty also produced a map in 1912, indicating those islands as Chinese territories. China’s claim covers about 90% of the South China Sea. Before 2009 no country protested against China’s claims to those islands. Philippines staked its claim in 1971. By 2009, the Philippines claimed that they have been occupying Zhongsha since 1946. They further added that Zhongsha was discovered by Spain during the 18 century , and was therefore part of Philippines territory. But in 1898, when Spain ceded all Filipino territories to the United States of America, there was no statement to include those islands. So the claims of Philippines has no merit. Those islands are 160 km from Philippines shore, and in 2012 there was a stand-off between the Philippines and China at Scarborough Shoal. Vietnam was a colony of France. In 1933, France claimed Nansha for Vietnam but the claim did not go through because of the interference of China. And China never abandoned Nansha from 1933 until today. According to United Nations Convention on the Law of the Sea (UNCLOS), land ownership generates rights over the seas for 12 nautical miles. But those islands were Chinese territories more than 2000 years ago. The countries which claim those four groups of island are Vietnam, Philippines, Malaysia and Brunei. During the Northern Song Dynasty (960-1126 AD) Chinese national expeditions again confirmed those islands as Chinese. Why did not Vietnam object at that time? Vietnamese maps, until today used Chinese names to identify those islands. The Chinese confirmed and declared the “nine-dash line” in 1948. It was only in 1994 that the United Nations’ Convention on the Law of the Sea was ratified, 46 years after the “nine-dash line” was declared? Why? And until today, USA has not yet ratified UNCLOS. 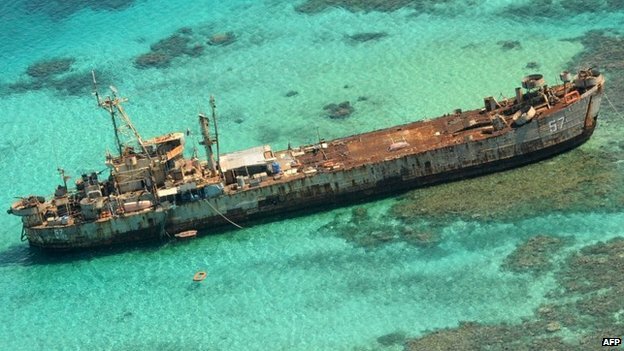 On 30th March 2014 the Philippines submitted (a 4000-page-memorial) its formal plea to the United Nations tribunal contesting China’s claims of those islands. It claims that area based on its exclusive economic zone. According to the government of the Philippines, those islands are 870 nautical miles (1611km) from nearest Chinese shore, and are therefore illegal for the Chinese to claim them according to the United Nations Convention on the Law of the Sea. But when was the EEZ introduced? The UN gave China six months to respond to a complaint by the Philippines. Why should China respond when historically those islands were listed as Chinese? The “nine-dash line” was introduced by China in 1947, why was there no one country to dispute that? At the moment, it is more a ploy to encircle and contain China because of its growing power and fame. By Customary International Law, which recognizes historical claims of territorial rights, the Chinese are the true owner of those islands. At a time when China was weak, Western powers created the norms and rules favoring the South East Asian countries, and Japan. The Philippines is provoking China like a clown and we believe some super power must be behind it. So for the moment, Philippines is enjoying some comfort in small victories, while Vietnam, Malaysia and Brunei only wait to see if they must also sue the Chinese. What are the legal merits of the claims made by these South East Asian countries, and Japan, based on? Manila had been set by the UN arbitration tribunal at The Hague to submit evidence to back up its claims in the South China Sea by 30th March 2014. Why are Vietnam, Malaysia and Brunei not willing to hand over their claims to this tribunal? In 1974 and also in 1988, Vietnamese soldiers confronted the Chinese but lost both battles and they have not bothered the Chinese until today. Under water seismic survey and investigation were conducted by China more than ten years ago. During those operations, the ships involved would have to remain in those waters for months and at times for years. WHY DID Vietnam keep quiet during the past over ten years? Now when oil and gas worth many billions of US dollars are confirmed under the seabeds, suddenly Vietnam says China is an intruder, and sends a wave of lethal anti-Chinese sentiment across the world. There may be a miscalculation that could trigger a wider conflict which no one wants to see. But do you think the US citizens want another Vietnam War? At the moment there are some Philippine soldiers stationed on board BRP Sierra Madre, which they deliberately grounded on the disputed Second Thomas Shoal. And then they stationed nine marines aboard that rusted World War 2 vessel. More than half of world’s annual fleet of tonnage as well as four fifth of the crude oil delivered to China passes through the South China Sea. Now this is the most contested mass of water in the world. Many countries do not want to talk about history when they claim these islands. They only want to stir up scary stuff about China, and to destabilize and defame China. The most strategic case is Diao Yu Tai, (the Japanese called these islands Senkaku) now controlled by U.S. and Japan. This area blocks Chinese access to the Pacific Ocean. But according to Chinese history, recorded evidence indicated the Chinese already owned those islands during the 14th century. Why were the Japanese and U.S.A. keeping quiet at the time? For the Spratlys alone, they are made up of over 100 islands and reefs which were many times bigger over 2000 years ago. Even today, they still cover about five sq. km. Invasive attitude and ‘not letting any country to sit in rest’ are important strategies of super power countries. The way of intruding has been changed over time. Now the super power country don’t come physically rather they do it with other countries. They help the nearby or suitable country nearby of their targeted country. They create a situation which unrest that region and then help their so called “friend’ country and ultimately conquer the whole territory! Then just put an obedient person as a ruler of that territory and those lands are considered as part of the super power, unofficially!! In south east Asia, a silent war is going between India and China to be super power of this area as both are having that much resources. But it will not be possible until they get adequate help form established super powers of the world. So there will be “play”. Those who are more tactical, they will win and rule this area. The issue about ownership of island which was disputed previously and for long time, is just a way of that procedures influenced by super power. Time will say how nicely China handled these!! Thanks for informative post regarding a “political” issue. Keep posting! Thanks, Hafiz34: You sure know what is going on. There are still people who create situations for others to fight on the streets. These are the real assholes !